SQL Server, the best RDBMS that is highly result-oriented and trusted by IT organization. It is capable of handling crucial business data in form of tables. Whenever you need to access the data stored in the SQL tables, you need to run queries for getting the desired information. But sometimes due to improper handling and unexpected actions, MS SQL Server can face disastrous situations. And one such SQL Server error is Error 8942 that is related to database tables. Server: Msg 8942, Level 16, State 1 Table error: Object ID O_ID, index ID I_ID, page P_ID. Test (TEST) failed. Slot S_ID, offset 0xADDRESS overlaps with the prior row. Overlapping of the slots. In normal cases, the offset of the next slot should be greater than the previous slot but due to some reason, the offset of slot S_ID is not equal to or greater than the previous slot end. Structure of the tables gets damaged maybe due to hardware malfunction. In simple words, whatever may be the reason for the error whether direct or indirect, it affects the SQL database tables adversely. Hence, it becomes the priority of the database administrator to resolve the issue instantly. 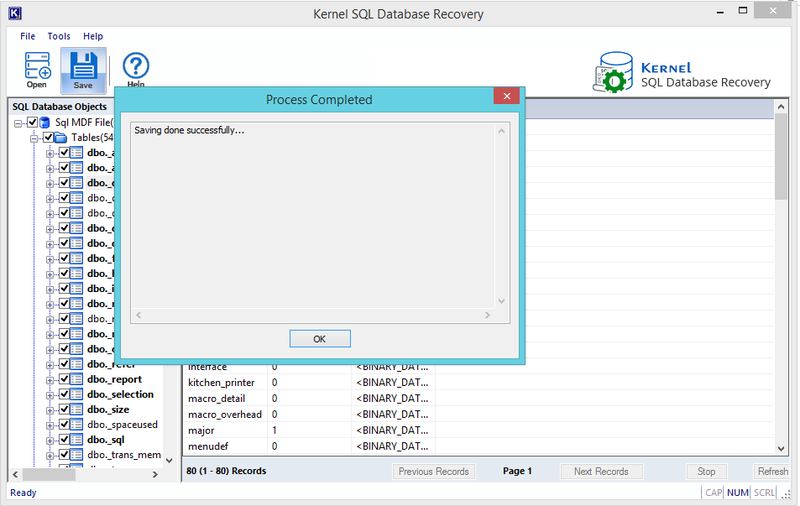 So, here are several options that can be considered to fix and recover data from SQL error 8942. There can be some hardware issues behind this error. So, diagnose the system, application and SQL Server error logs to know the exact hardware issues. If there is some hardware issue, then replace the damaged hardware with the healthy one. If there is no hardware issue, then run DBCC CHECKDB command without using any repair clause. The DBCC CHECKDB command determines the repair clause that is required to be applied for resolving this error. After getting the repair clause, run DBCC CHECKDB with the exact repair clause. The above manual methods could be very tricky, time-consuming and require expertise, otherwise, there is a high possibility of data loss. Therefore, investing in the technically specialized third-party tool namely Kernel for SQL Database Recovery will be the best choice. It is an efficient and convenient SQL recovery software that helps to repair the corrupt and damaged MDF files. MDF files that are used to store data can get corrupt due to unexpected system shutdown, engine errors, power failures, virus attacks or software errors. 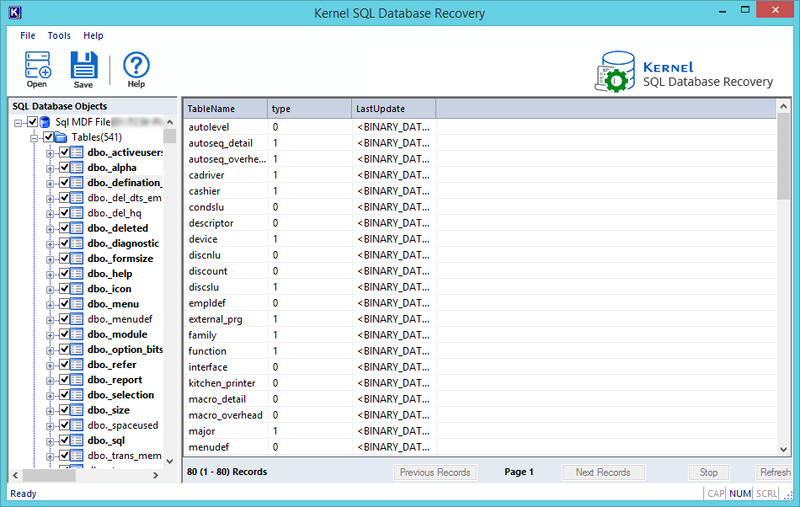 Kernel for SQL Server employs efficient recovery engine to deal with such corruption issues and provide the desired results. 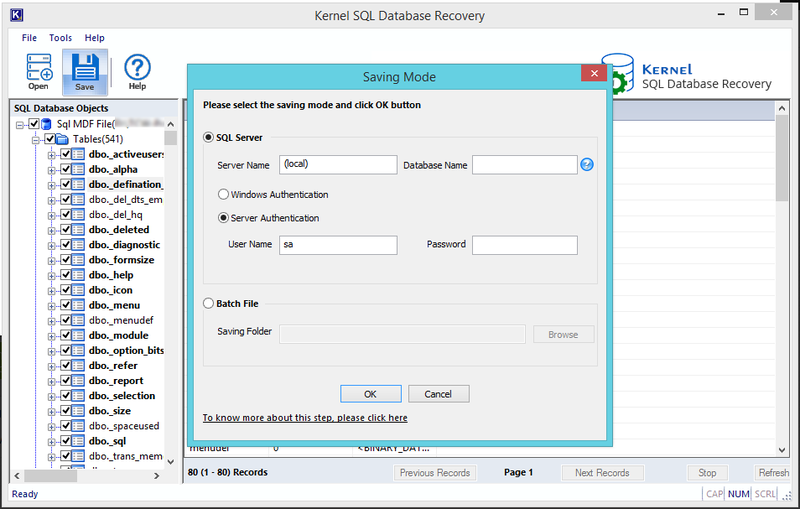 Step 1: Download, Install and Launch Kernel for SQL Database Recovery tool and click Browse button to select the corrupt MDF file for recovery. Step 2: You can view the complete recovered MDF file data with the help of the inbuilt and automated Preview feature before saving the recovered items. Step 3: Select the desired Saving Mode amongst the two options provided and click OK to proceed for saving. Step 4: Once the file is saved, you will receive a message saying, “Saving done successfully”, click OK to finish. In the end, all the possible and workable methods are suggested to resolve SQL error 8942 manually and professionally. But, we recommend opting the professional solution as priority as manual methods have so many drawbacks. 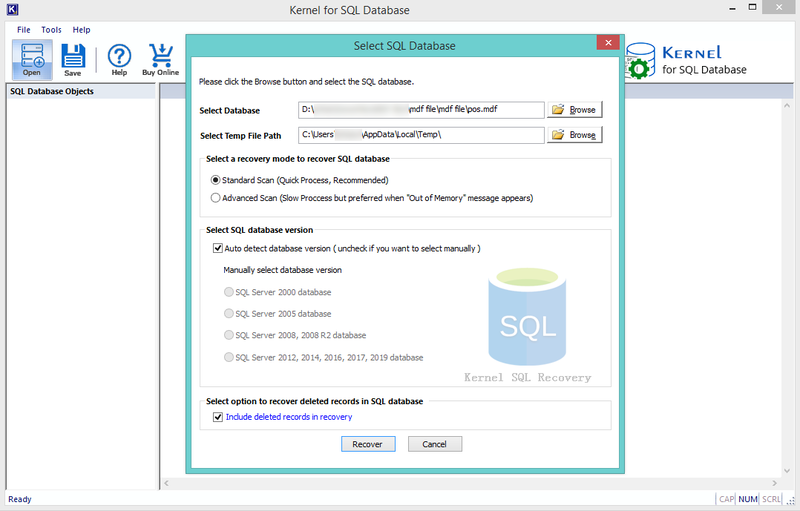 Tip: Try free to download version of Kernel for SQL to know the working features of the software.